ThisIsBeer.ie has arrived. 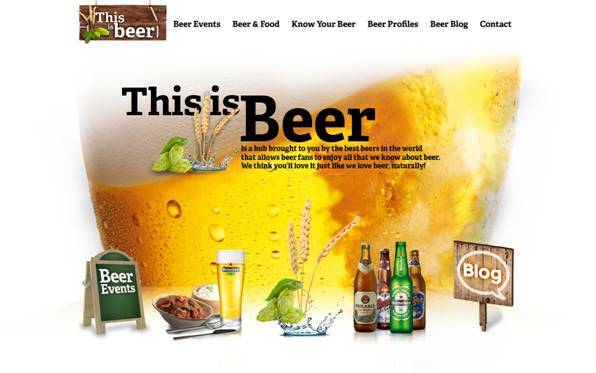 Thisisbeer.ie is Ireland’s newest online beer hub built to celebrate the natural goodness of beer. Some of the best beer brands in the world have come together to create a platform where enthusiasts and novices can discuss, learn about and experience beer to its fullest. Over 40,000 beers worldwide are made of just three natural ingredients; water, hops, and barley, making beer a natural match to food. ThisIsBeer.ie offers up a wide range of beers with delicious recipes, in keeping with the fast growing global trend of matching food. With regular blog contributions from a wide range of experts in beer, nutrition and food, Thisisbeer.ie is the perfect place for budding beer aficionados to keep up to date on news and facts about beer. Thisisbeer.ie delivers video blogs, true or false beer quizzes and tips on how to pour, store and cool beer for the discerning beer drinker. The website is a Heineken Ireland initiative and features the wide range of beers available from Ireland’s number one lager company. Heineken Ireland’s portfolio includes beers from around the world such as Ireland’s number one lager; Heineken, Tiger, Coors Light and a full range of specialty beers which includes Paulaner, Moretti, Affligem and Zwyiec.